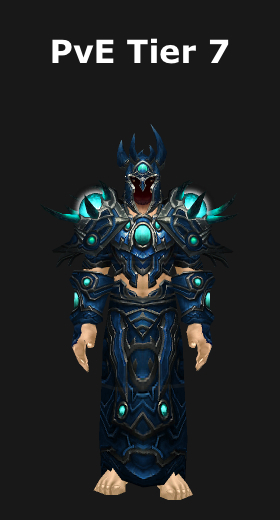 Shamans have 3 Tier 7 sets: a healing set and 2 DPS sets. These sets look exactly the same. Each set consists of 5 pieces that can be exchanged, with Bragund Brightlink in Dalaran, for tokens that drop from bosses in the first tier of 10-man Northrend raids (Naxxramas and The Obsidian Sanctum). Some of the tokens (Chest and Hands) can also be bought directly from vendors in Dalaran for Gold. Additionally, some pieces (Chest, Hands, and Legs) are dropped by Archavon the Stone Watcher in the 10-man version of Vault of Archavon.